SIIG's DP USB 3.0 2-Port PCIe-Value instantly adds two SuperSpeed USB 3.0 ports to your PCIe-enabled desktop computer. This adapter enhances existing computer system by enabling the latest USB 3.0 technology to deliver maximum data transfer rates of up to 5Gb/s to support high-bandwidth USB 3.0 devices, such as external hard disks, high resolution webcams, video surveillance cameras, digital video cameras, multi-channel audio and more. 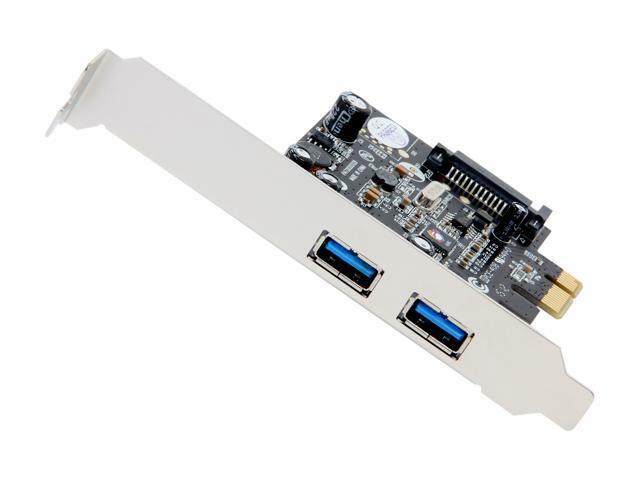 It is backward compatible with USB 2.0 and USB 1.1 devices and features dual-profile PCB design to work with full height and low profile chassis system with the included bracket. The DP USB 3.0 2-Port PCIe-Value host adapter is fully compliant with USB 3.0 Specification, Revision 2.0 and PCI Express Base Specification, Revision 2.0 standards. It comes with FCC Class B (DoC) & CE regulatory approvals and RoHS compliancy, is fully compatible with a wide variety of Windows operating systems and backed by SIIG's limited lifetime warranty. Works with high-bandwidth USB 3.0 devices, such as external hard disks, high resolution webcams, video surveillance cameras, digital video cameras, multi-channel audio and more.